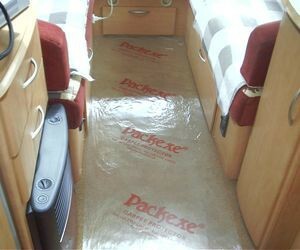 Packexe carpet protection film is a quality self adhesive solution for laying over carpeted floors. As denoted by the red printed logo it is used for the temporary protection of carpet tiles, carpet, rugs, mats and staircases. 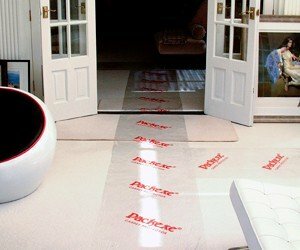 The low slip film prevents tripping which is normally associated with rucked dust sheets and especially when covering up stairs. This durable heavy duty transparent film is ideal for high footfall areas and protects against spillages, muddy feet and building debris. The product can also be mopped, vacuumed or swept while work is being carried out. At 625mm wide by 25 metres long, cover your existing floor covering quickly and easily without using traditional cloth dust sheets. Its strong adhesive grips the film to the carpet pile but can be easily peeled off again without leaving a sticky residue. One 25 metre roll is enough to cover approximately 15 square metres or 60 carpet tiles. 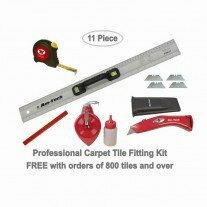 If used on non-carpeted surfaces the film may cause damage and be difficult to remove. 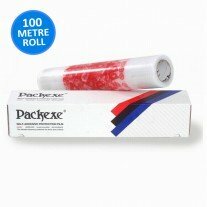 PLEASE NOTE:- For larger areas a 625mm x 100 metre roll is also available to purchase on our site.